On Monday evening, you may have seen news of a "big scoop" at Slate by famed reporter Franklin Foer, about how Donald Trump had a server that was "communicating" with a Russian server. Foer, who famously got pushed out of The New Republic for not being very with it on technology on the internet (among other things), makes a really big deal out of some really weak tea. After reading the article (along with another one alleging Russian spies had been "cultivating" Trump) I tweeted out that the evidence on both was super weak. I kept expecting a smoking gun in the Foer piece, but instead got a lot of handwaving and confusion about DNS. Of course, Clinton supporters were quick to jump on the article as some sort of proof, despite the really weak claims. A lot of Foer's work stems from an anonymous blog post from a few weeks earlier that tries to make a big deal out of some extraordinarily weak connections. The confirmation bias is strong with the folks involved here. The biggest clue? This ridiculous chart that tries to show increased activity between the Trump server and the Russian bank server at key moments, but doesn't actually show that. There seem to be random ups and downs at the conventions, and then a huge spike in the middle of August which corresponds with... nothing. But the researchers and Foer just ignore it. In fact, Foer actually claims that "there were considerably more DNS lookups, for instance, during the two conventions." Except there weren't really. 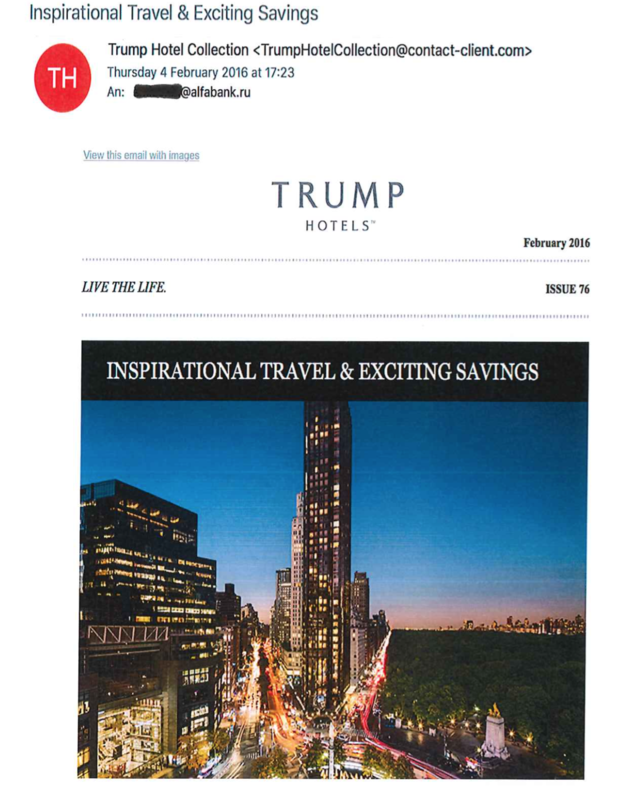 The Intercept actually reached out to Alfa-Bank... and got the hotel spam that it had received from Trump. They also received the similar spam from Spectrum Health (who is included in Foer's story for reasons too pointless to explain). Guess what: spam. This is why we can't have nice things on the Internet. Investigative journalism is dead. The Internet is full of clues like this if only somebody puts a few resources into figuring things out. For example, organizations that track spam will have information on exactly which promotions this server has been used for in the recent past. 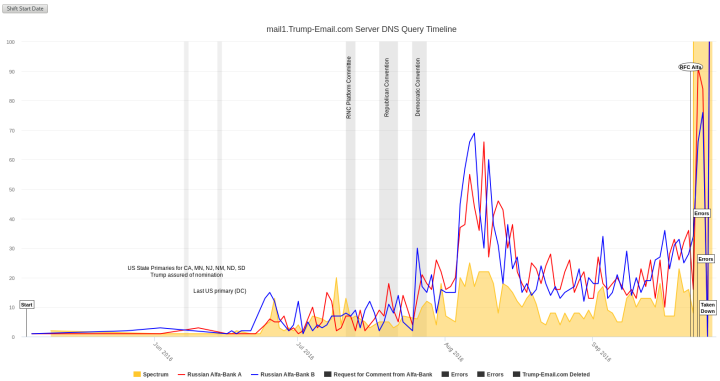 Those who operate public DNS resolvers, like Google's 8.8.8.8, OpenDNS, or Dyn, may have knowledge which domain was related to mail1.trump-email.com. Indeed, one journalist did call one of the public resolvers, and found other people queried this domain than the two listed in the Slate story -- debunking it. I've heard from other DNS malware researchers (names remain anonymous) who confirm they've seen lookups for "mail1.trump-email.com" from all over the world, especially from tools like FireEye that process lots of spam email. One person claimed that lookups started failing for them back in late June -- and thus the claim of successful responses until September are false. In other words, the "change" after the NYTimes queried Alfa Bank may not be because Cendyn (or Trump) changed anything, but because that was the first they checked and noticed that lookup errors were happening. Malware research consists of a lot of informal relationships. Researchers get DNS information from ISPs, from root servers, from services like Google's 8.8.8.8 public DNS. It's a huge privacy violation -- justified on the principle that it's for the general good. Sometimes the fact that DNS information is shared is explicit, like with Google's service. Sometimes people don't realize how their ISP shares information, or how many of the root DNS servers are monitored. This is another reason why we've pointed out that all the focus on "information sharing" in various cybersecurity bills from Congress was a red herring. Information sharing can lead to all sorts of questionable activity. It's done in these instances for the purpose of spotting malware, but it appears some researchers went looking for weird Trump conspiracy theories and were so invested in those theories that they didn't even realize how ridiculous it was when looked at in the light of day -- and also forgot that they're not supposed to reveal they have access to this info. Yes, of course, we're at the very peak of the political silly season and lots of people are looking for big breaking stories. But it would be nice if we could keep them in the realm of reality. If someone's technically knowledgeable enough to know to ask this question, why would they waste the time? I imagine they'll spend half an hour on hold, then talk to someone who has no idea what "DNS" is, then maybe get bounced around awhile after resetting their modem/router/PC... and if they're lucky enough to find someone at the ISP who knows about technology, what are the chances that they also know about data-sharing policy? If you know what DNS stands for, you probably know enough to set up your own recursing server or point to an open one that's not your ISP's.